Mongooses are a species of small carnivorans from southern Eurasia and mainland Africa. Mongooses are commonly terrestrial and many are active during the day. Some species lead predominantly solitary lives, seeking out food only for themselves, while others travel in groups, sharing food among group members. The Meerkat is a species of Mongoose, a small, diurnal mammal that forages for invertebrates in open country. Its behavior and small size make it enticing to larger carnivores and birds of prey. However, it can capture and consume small migrating birds. Sugar states were established in the Caribbean during the 1600s and 1700s to exploit profits from the high demand for sugar in Europe. The Europeans brought unintended new species such as rats in ships. Initially, the rats were rife and destroyed up to a quarter of the annual crop of sugarcane. 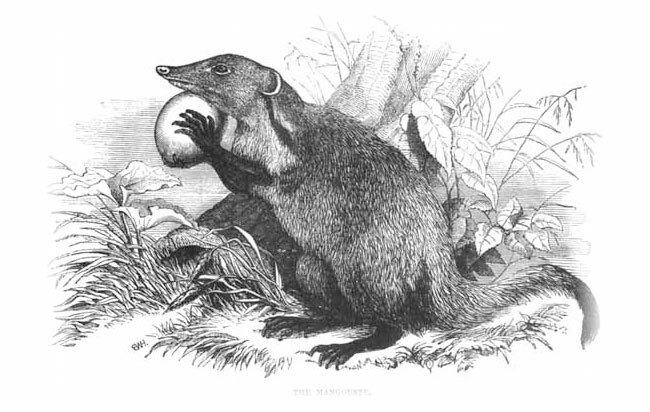 In 1872, a Jamaican sugar planter, Mr. W. B. Espeut, imported small Indian mongoose (Herpestes auropunctatus) and released them on his plantation. The rat populations were reduced, so other farmers brought them to release into other areas, including Puerto Rico, Barbados and Cuba. The Buddhist god of wealth Vaisravana, or Dzambala for Tibetans, is frequently depicted holding a mongoose that is spitting jewels from its mouth.